Overflowing with the energy and ideas of youth, children are natural artists. They approach drawing with a joyful abandon and lack of inhibition. As they grow, they pass through five stages of art development. Unfortunately, many children's artistic growth becomes stunted in the early teen years. But with support and encouragement, they can continue to grow as artists. Art programs help young children to foster perception and critical thinking, develop fine motor skills, and learn social and group skills. These are crucial to the child's intellectual and social development. 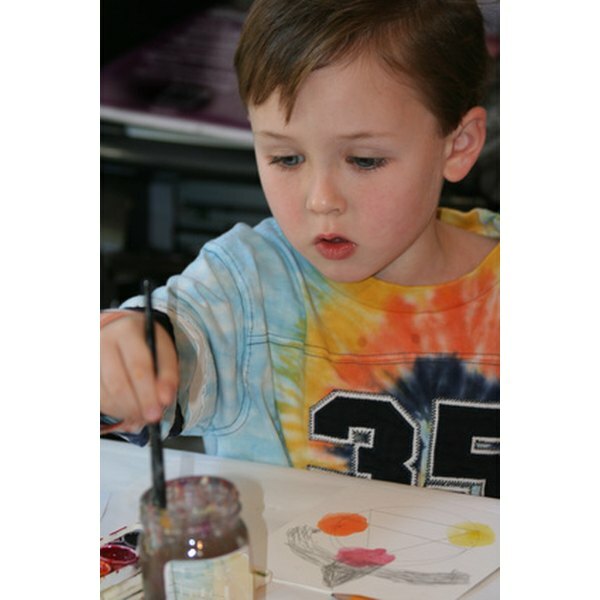 Art fosters four processes essential to creativity: imagination, a sense of purpose, an original idea or product, and the value of that original idea in connection with the task at hand, according to the National Advisory Committee on Cultural and Creative Education. In the classroom, artistic activities not only provide children with an outlet for their emotions, but also encourage acceptance of diversity as they experience and appreciate the work of others. Children's artistic development can be divided into five important stages, according to psychology researcher Viktor Lowenfeld. The first stage is scribbling, from about ages 2 to 4. As the child shows more control of the images, he begins to tell stories about them. The second, or pre-schematic, stage is roughly from age 4 to 7, when the child combines circular sketches with lines that resemble people or animals. In this phase a visual idea (schema) is somewhat developed and shows what the young artist sees as most important. At this point, the child's drawings reflect the observation of others and experimentation with colors and shapes. Some geometric figures start to appear. From approximately age 7 to 9, the young artist passes through the third, or schematic, stage in which shapes and objects become recognizable and the use of colors realistically reflects objects and creatures. Drawings include a base line and sky line, with a clear sense of up and down, although some figures might appear to be upside-down. Exaggeration of figures shows strong emotion or the importance of images. An idea, or schema, for the drawing is apparent. The child draws more groups rather than single individuals and includes buildings, animals, trees and adults. In the fourth stage of a child's artistic development at about 9 years old, the child becomes more focused on the drawing process at the same time that self-awareness and group identification develop. Whereas in earlier stages the child might have felt the freedom to take risks, the focus now becomes trying to overcome whatever limitations she has in producing a "realistic" image. Then, at around age 14, a child's sense of shame often overpowers the need to be creative, ending efforts to advance artistically. Art helps children develop abstract and critical thinking skills as well as originality in solving problems. These skills can be applied in every other area of their lives. It also fosters creativity. Information from Pearson Allyn Bacon Prentice Hall posted on the Education website refers to a study in which testing identified 1,600 children at the top level of divergent thinking and creativity in preschool. Using the same test, only 32 percent of the children were in the top range at 8 to 10 years. By the time the children reached 14 to 15, only 10 percent tested in the uppermost range. Education.com: Art Development in Young Children"